It has been a crazy, tiring month! However, despite the sleep deprived nights, long, thirsty days and food coma evenings, it was a great Ramadan and I enjoyed every single day and night. It was a very busy month and the long days made fasting a little difficult, but more than the lack of the food, it was the lack of sleep that hurt the most. By the time we got back from the Islamic centre at night, it was almost 11.30 and then to turn around and wake up for our pre-dawn breakfast at 3 am, it was incredibly difficult. My children had their routine figured out, they didn’t sleep until after dawn and then slept all day until 5 pm; just in time to get dressed to head out to the Islamic centre to break our fast and evening prayer. I was quite busy since I signed up to cater many of the dinners served at the Islamic centre. Many people sponsor the dinner during the month of Ramadan because there is great reward in feeding a fasting person. All thirty days, there was dinner at the Centre. I was hired by about six families to cater their dinner and so that kept me quite busy. I also sponsored my own dinner and decided on beef stew, rice, rolls and peach cobbler for dessert. I was hoping it would be a change from the usual Indian dinner we were eating everyday. I think people enjoyed it…at least they told me they did! So, you can understand why I didn’t blog much during Ramadan, because even though I wasn’t cooking to blog, I was cooking! We ate at the Centre almost everyday and apart from doing the supply shopping for my catering orders and breakfast items, I didn’t do any groceries for the house! I still haven’t gotten back into my cooking groove. I am still recovering from sleep deprivation and find myself taking random naps throughout the day. I have completely neglected my house and I have a pile of chores that so desperately need to be tackled. Soon, I hope. 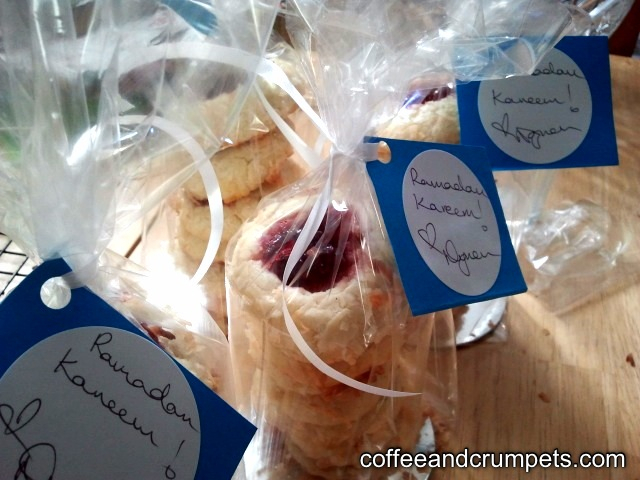 When Ramadan started, I made some cookies to hand out to friends and neighbours. It’s a way to introduce Ramadan to neighbours who may not be familiar with the Islamic holiday that is so important to Muslims around the world. It’s also nice to share the beginning of the month with friends and to exchange treats to enjoy before we give up food for a month! Since I haven’t started cooking and baking yet, I thought I would share my Ramadan cookies with you. 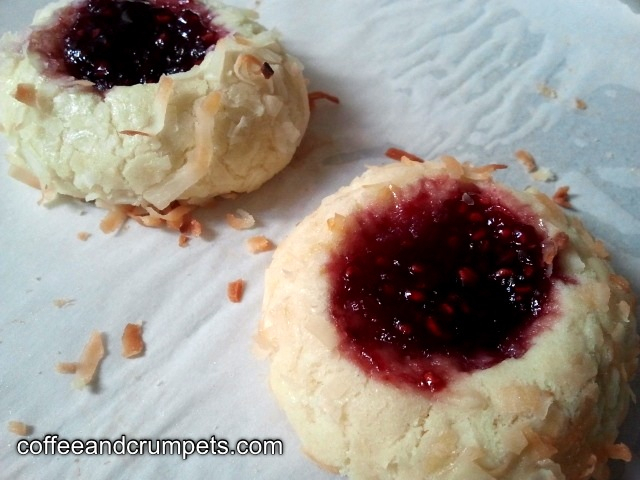 They are simple but delicious thumbprint cookies; buttery, shortbread cookies with a dollop of jam in the middle. Preheat the oven to 350 deg F/180 deg C and line a cookie sheet with parchment paper. Using a mixer, beat the butter and sugar until light and fluffy. Add the egg yolk and vanilla extract and mix until combined. In a separate bowl, combine the flour and salt until thoroughly mixed. Add the flour-salt mixture to the butter/sugar batter and beat until combined. Refrigerate the mixture for about 15 minutes before rolling into balls. Meanwhile, whisk the egg white until frothy and keep aside. Put the coconut onto a plate, ready to dip the cookie balls. Remove the cookie dough from the fridge. I used a small cookie scoop to portion the cookie balls and then roll them. You can use a scoop or a teaspoon to scoop out 1 inch cookie balls. Roll them into balls, dip into the egg white and then roll in the coconut. Depending on how big the cookie balls are, you will get between 15-20 cookies. Place the dough balls on a cookie sheet lined with parchment paper, leaving about 1.5 inches between them. They do spread a little. With your thumb or the back of a wooden spoon, make an indent in the cookie ball. Drop half a teaspoon of your choice of jam or curd. Bake the cookies for 15-17 minutes until they are lightly browned and set. 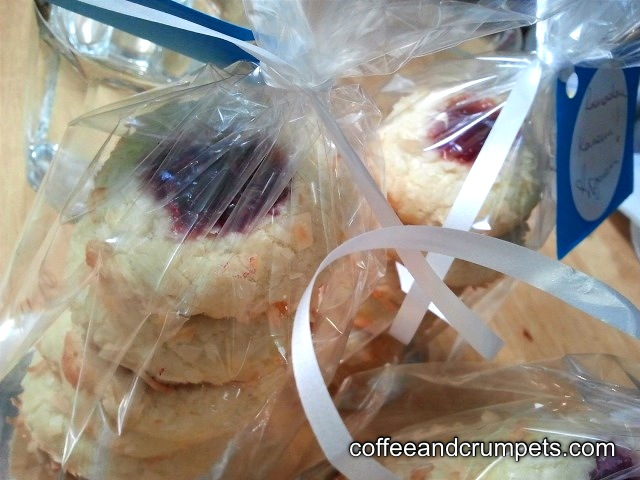 cookie bags or boxes, add a label and some pretty ribbon. It feels good to be writing again and I hope to get back in the kitchen very soon. I have so much catching up to do! Thank you for reading and I hope you have an amazing weekend and week ahead! I didn’t know details about ramadan (more like life style wise) and thank you for sharing. Pretty intense but it’s nice that you enjoy every day and night of it. And what a nice way to offer neighbors and friends these cookies. Surely they get to know more about ramadan and become curious like me trying to see how you do it. Beautiful cookies and packaging! Thanks Nami. I am glad I was able to explain a little about my holidays. Thanks Bikram, nice to see you on here too. How are things in the UK? Yes, it’s always a bit hard during the fasting month but billions of people are doing it with me so it doesn’t feel so bad! 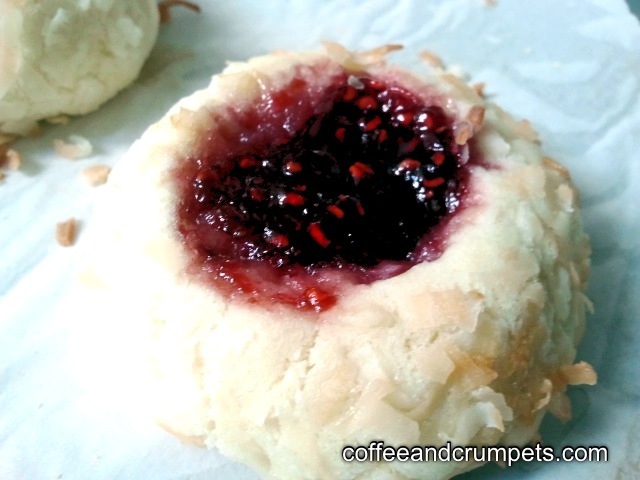 Jam cookies taste good but everyone knows how to make these. Nice to know Ramadan was such a success for you! These cookies look super delicious and incredible! Thanks! Feels good to be back, but I still haven’t set foot in the kitchen. I feel really burnt out! I hope inspiration strikes soon so I have something to write about! Welcome back!!! Wow! What a schedule!! Good thing your kids didn’t have school…..it would have made it even more difficult. But it sounds like loads of fun, and awesome time you had with all the activities. My Aunt used to bake similar cookies when we visited them every winter….she is no more, but those cookies made me nostalgic. Thank you Minnie. It was very hectic but I was running on adrenaline then, I seemed to have totally fizzed out now. Hopefully, I can get going soon. Everyone has a version of these cookies. I almost didn’t post them but I had pictures and a recipe and they looked cute so I decided to just do it. They are very tasty and that’s why they have lasted all this time I think. I always try to bake something for the neighbours and for Laith’s classmates too to celebrate our holidays. It’s just more festive to share. Chores are still piled up. I am hoping to get to them this week….but I am so tired! I haven’t actually cooked anything since last week, can you believe it?! I’ve been a terrible mother and feeding my children pot noodles and fast food! I make almost those exact cookies for Christmas. My husband loves them and I do too. They are very simple to make. I have not tried rolling them in coconut. I will do that next time! I adore coconut. Glad to see that you enjoyed every day of Ramadan. It’s good that the kids were not in school at that time. I can’t imagine how they and you cope if they have to leave for school every am. I just went back to my school, this was the first week back and I am recovering this weekend. It’s pretty intense and takes all my energy! I think everyone has a recipe for thumbprints! In some variation or another. They are so good though and fairly easy to make because you don’t have to roll them out etc. It defintely was easier as far as school goes this year. We could sleep in after our morning breakfast and not have to hurry for school. Hope your school year has started off well! !